A New Map of the So. & Mid Parts of Antient Greece viz. 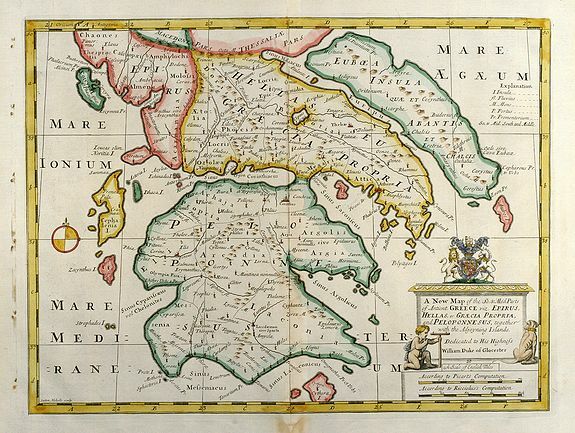 Epirus, Hellas, or Graecia Propria, and Peloponnesus, together with Adjoyning Islands - WELLS, E.
Title : A New Map of the So. & Mid Parts of Antient Greece viz. Epirus, Hellas, or Graecia Propria, and Peloponnesus, together with Adjoyning Islands. Size : 14.3 x 20.3 inches. / 36.3 x 51.5 cm. Description :Decorative coloured map of the Peloponnese (Morea) in Greece. Condition : Small holes in left margin, minor browning in lower margin around centrefold. Manuscript page number by old hand in upper right margin. Excellent condition.